An excellent screen recording app with a user-friendly interface and impressive video editing features. Record high quality videos using the best android screen recording application which can be downloaded free of cost. 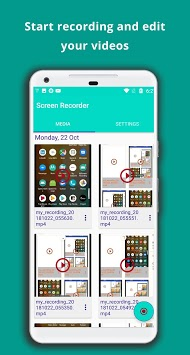 It is easy to use and highly customizable application allowing you to record whatever is happening on your Android phone’s screen. 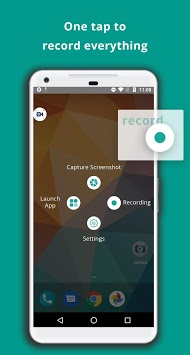 - Screen recording with audio: You can record your screen along with the audio. - Edit videos: A user can very easily edit the recorded videos in between as well as after the recording is completed. It also has an option to crop the length of the video whenever required. - Display Recorded Video list: A list of your recorded videos is displayed in the application where one is able to retain all the videos from starting which acts as a Video gallery. - No time limit: There is no such time limit for the duration of the video recordings. One can record any length of the video he/she desires. - Option for video sharing: Users can share the recorded videos from within the application to any external application such as whatsapp, Facebook etc. - Upload on Google Drive: The amazing screen recording application lets you upload the video directly on Google drive from the app itself and share with the world. - Timer before recording: It also has a feature which displays a timer before starting to record a video. This gives the user proper time to adjust and start the recording accordingly. 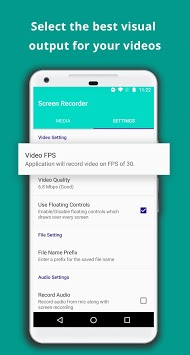 - Resolution and Frame rate: A user can adjust the screen resolution and the frame rate by himself to record high quality videos with the help of this application. - File name prefix: You can add the file name as per your requirement making it easy for the users to search for in the gallery. While recording, this application allows you to use both front and rear cameras. It is a lightweight and a free application with the best screen recording features as well as quality.